Specialists of the Ministry of Science, Technology and Environment (CITMA) and the Physical Planning Institute are conducting a study with the objective of improving the road that link Trinidad to the city of Cienfuegos. Nestor Alvarez Cruz, Director of the Environmental Center in the province of Sancti Spiritus, told Escambray daily that the investigation is an interest of the Tourism Ministry in the central territory and other institutions like the CITMA office. 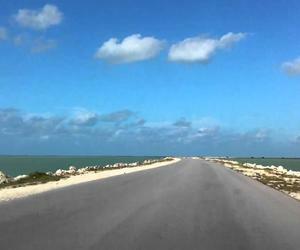 He added that this is a road that is mainly located along the sea and serves as a tourism corridor between both cities to the central southern region of Cuba. Alvarez Cruz also pointed out that the locals from Sancti Spiritus work in outlining the 14 kilometer road between Trinidad and Cabagan, while the rest of the path (some 60 kilometers) will be the responsibility of the specialists from Cienfuegos. According to the research carried out, the road will be returned to its original characteristics, in addition to planting trees more isolated from each other that will allow a view of the sea. The specialists said that there are places where the vegetation is so dense that there is practically no visibility. The area of natural attractions offers the possibility of preparing small beaches that exist within the corals and also the construction of cafeterias to improve the tourism corridor along the road.